After the frenzy of starting and finishing a quilt for Karen Lewis in less than a week it has been lovely to take things a bit easier this last week. 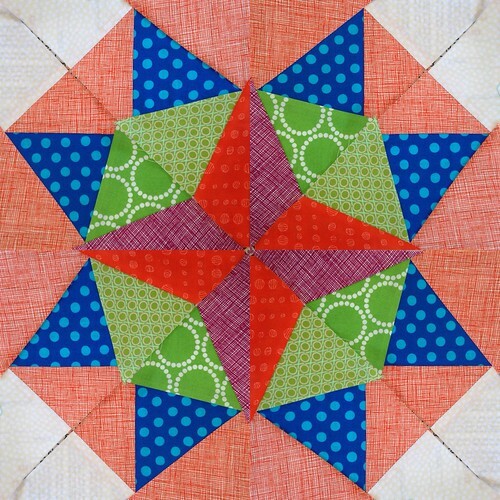 Ever since the Marcelle Medallion pattern by Alexia Abegg was released I have wanted to make one; I eventually got round to buying the book in August 2013 (yikes! I hadn’t realised I’d had it that long!). 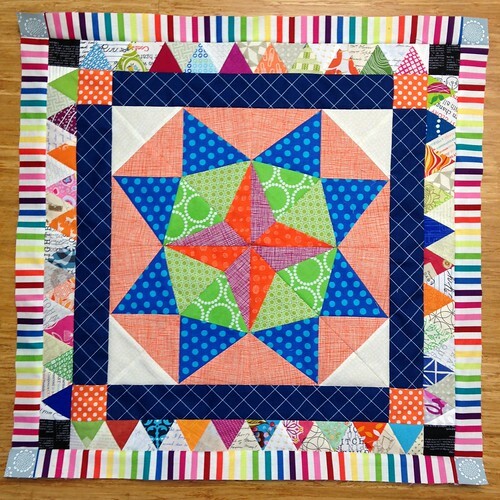 It’s taken until now for me to find the time and headspace to make a start and spurred on by Cindy working on her medallion quilt (check out the latest post – it’s looking stunning). I’d looked at the pattern a number of times, read other people’s post on it, followed the QAL and drawn up a foundation paper piece template in touchdraw. At the weekend I printed off templates, not as easy as it sounds as somewhere between the iPad, laptop and printer there was scaling going on. Eventually I worked out that I need to print each section off broken into 2 and the tape them together so that scaling stopped! 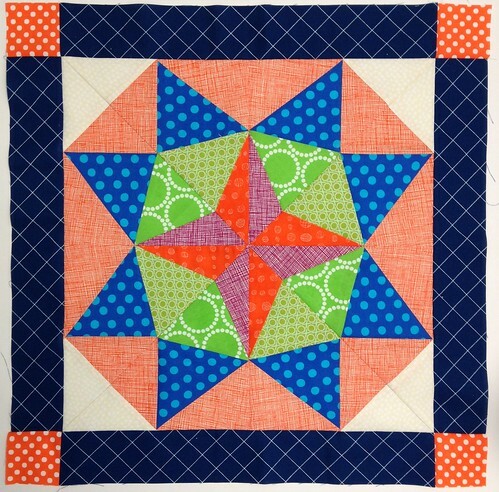 Border 2 came from my scraps bins; for such small pieces it seemed wrong to cut in to full fat quarters. 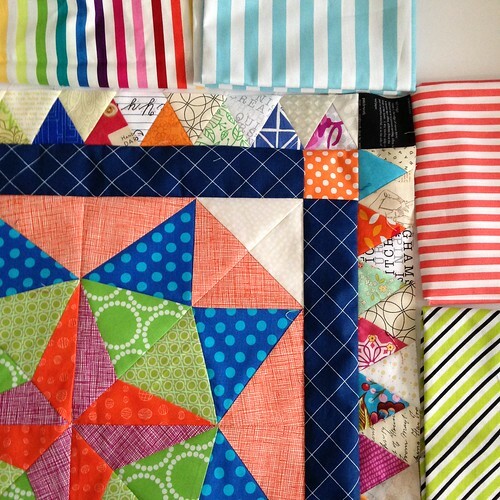 It does mean that the quilt is starting to look different from my fabric pull in the first picture. 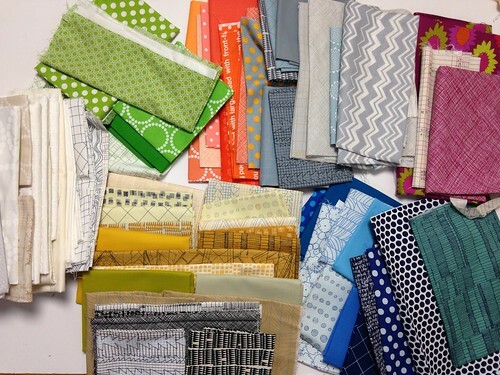 Have you ever pulled fabric for a project and ended up using a different set of fabrics? 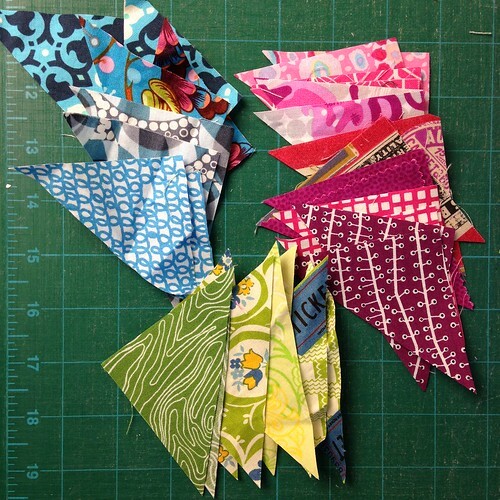 I have a bag of low volume scraps that I worked from too. Next I needed to make a decision on border 3. I’d gone to bed on Tuesday evening thinking about the rainbow fabric and wondering if I had any left, I found it yesterday and it was definitely the winner for this one. So now I’m making a start on the cutting for the flying geese border. It may be half term but 3 children are content with lego, a cricket bat and cardboard boxes so I’m attempting to make the most of it! This is going to be stunning – I love your colour choices! This is going to be gorgeous! 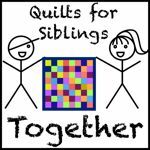 I have a medallion quilt on my list for 2016 and yours and Cindy’s have really inspired me to think about this sooner rather than later.